UK Construction Back to Normal But GBP/USD Still Sliding – A Top in Place at 1.35? The UK construction sector had weakened for many months and it fell into contraction in October. Many analysts saw that as the leading indicator (sign) that the UK economy was falling into recession well before Brexit even happened. The UK economy is not doing that great at the moment, but it is not falling apart either. The construction sector resurfaced last month and this time it climbed above 53 PMI points, beating expectations by more than two full points. That`s encouraging for Brexiteers and it should have been encouraging for the GBP as well, but the GBP doesn’t seem impressed. GBP/USD continues to slide and it is now more than 100 pips lower from the top last Friday. The top last week stood at around 1.3550. 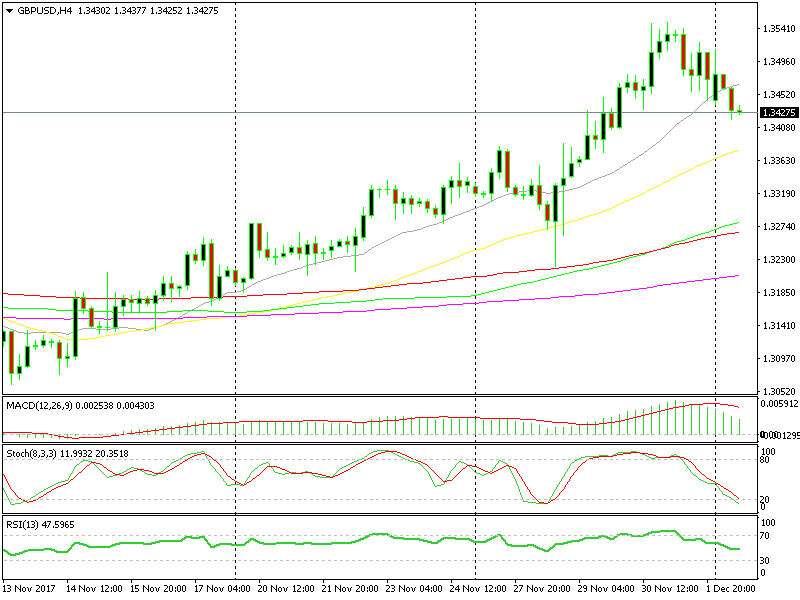 This forex pair closed above 1.35 last Thursday, but couldn’t stay above that level for too long. This sort of price action indicates that the selling pressure is strong above 1.35. The last time GBP/USD failed to stay above 1.35, this pair fell to 1.30s. So, the potential is around 400-500 pips if you are a GBP/USD seller. The weekly and daily forex charts are overbought and a pullback lower to that area is possible. Although, the Brexit is messy with lots of twists and turns, thus GBP might take any path. So, we’re leaving the decision to you whether to sell GBP/USD now with a target close to 1.30. The stop should obviously be above 1.3660, which has been the high since the Brexit vote.